Winchester is a historic city in Hampshire one hour from London. Winchester has one of Britain’s most amazing cathedral. It was voted by Halifax bank as one of UK’s best places to live. 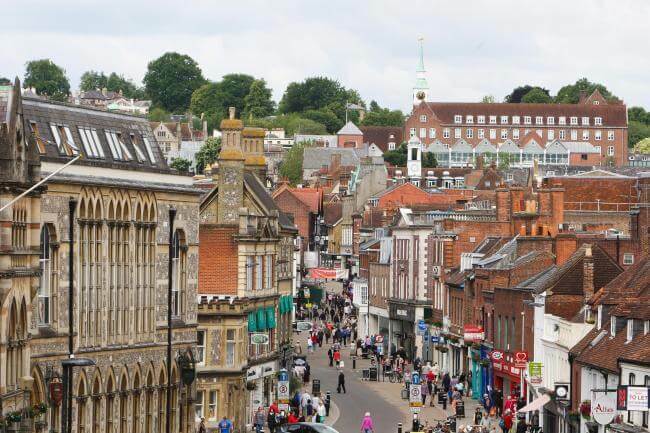 Winchester was voted for best quality of life in terms of average earnings, health, happiness and low crime. Winchester dates back to the Iron age, the Romans built there regional capital here, followed by William the conqueror, who built palaces and castles here. Jane Austin is buried here and John Keats lived here for a short time. These days Winchester is simply a great place to live and work. It has great shops with a great independent portfolio of traders in amongst the national chains. Hambledon square is the main shopping area. Winchester foodie scene is thriving, with a range of excellent restaurants. Rick Steins first restaurant outside of London was in Winchester. Winchester college is a renowned school, being of England’s oldest public school. Winchester is an expensive place to live with average prices being £555,000. Flats are around £220,000 and desirable semi detached and detached can be ranging from £800,00 up to £2,000,000. With the price of property so high loft conversions are an effective way to add additional room to your home. Touchstone lofts are experts in loft conversions and have been converting lofts for over 25 years. We can take care of all drawings and planning permissions, if required. Most loft conversions are “Permitted developments”, that is- no planning permission is required. With our in house planning team, our own loft teams, electricians, plumbers etc, we can take care of whole process for you.